Once the water has stopped flowing in and it is safe and reasonable to begin, water extraction must take place. This is a job requiring a fast response and industrial strength equipment. 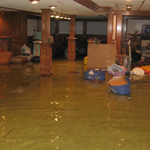 Water damage restoration isn’t limited to a storm’s aftermath. Burst pipes, basement seepage, roof leaks, condensation, sewage overflows, and other plumbing problems lead to water damage, especially if undetected. Whether water is actively flowing into your home or business or you want a water inspection to detect hidden leaks, you can count on us! We’re committed to providing Houston business and property owners with complete water damage assessments and restorations. Regardless of the cause, a prompt, thorough dry out of the affected area is a must. Don’t make the costly mistake of attempting to do this job on your own. We use industrial strength water extraction equipment, blowers, fans, and dehumidifiers that are far more powerful than the water vacuums and fans available to do-it-yourselfers. In addition to using powerful drying and water extraction equipment, we thoroughly inspect the home for missed moisture, clean up and disinfect contaminated items, and perform structural repairs. Because mold is an issue after any water event, we work promptly to remove moisture and apply mold inhibitors to inhibit mold growth.